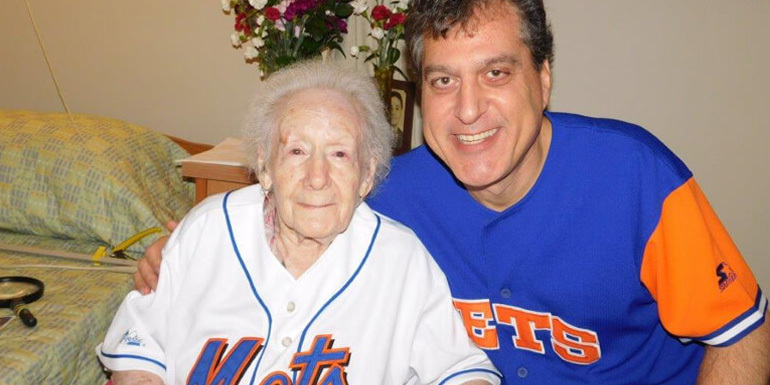 In celebration of the New York Mets Opening Day of the 2017 Major League Baseball Season this past April, Austin & Williams worked with client Gurwin Jewish Family of Services to celebrate 101-year-old Gurwin resident Rudal “Rudy” Ahlen’s love of the New York Mets and showcase the vibrant atmosphere at Gurwin. Rudy was featured in a story in Newsday, McKnight’s Long Term Care News and in a TV report on News12 Long Island, among others. Ahlen has been rooting for the New York Mets since she was a young girl. Originally a Brooklyn Dodgers fan, Rudy switched allegiances when the “Bums” moved to Los Angeles. “I was so mad!” the mother of eight recalls. But ever since, she has remained faithful to her “Amazins.” She’s a player herself—and was the only female on an all-male seniors’ baseball team on Long Island in her earlier days. As a result of the news coverage secured by A&W, the Mets invited Rudy and her family to a game on June 1!